The Kosmos Spielcomputer Logikus computer toy. Anon., “Un jeu pas ordinaire”. Photo-Journal, 15 to 22 January 1969, 10. How are you today, my reading friend? I ask you this question, with some trepidation perhaps, because I chose to stray further away from the one true path to illumination, that which leads to an understanding of all things aeronautical and spacey. Even though yours truly readily admits that I loathe computers with every fibre of my being, I found myself strangely attracted to this week’s topic, but back to our story, which is pretty cool. Lets us begin our exploration with a quote, in other words with the caption of the photo I found in the 15 to 22 January 1969 issue of Photo-Journal, a now defunct weekly published in Montréal, Québec, that you may remember from previous issues of our blog / bulletin / thingee. The latest fashionable design for children: a pocket computer. For $ 17 the “Logikus” minicomputer can set weather forecasts, medical diagnoses and exam programs. It is able to translate English into German, perform various calculations and even play football, thanks to a small system of lights that turn on and off. This game for twelve year old children has 50 electrical circuits. Designed for young humans aged 12 and up, the Kosmos Spielcomputer Logikus was put on the market in 1968 by Franckh’sche Verlagshandlung W. Keller und Company, a West German publishing house famous for its nature guides, children’s book and experiment kits. Would you believe that the first experiment kits came out in the 1920s and that new ones were being produced as of 2019? Young Germans / West Germans / Germans have spent countless hours having fun with All-Chemist, Elektromann, Optikus, Radiomann, Technikus, etc. Young humans in other countries had just as much fun playing with licensed versions of these same experiment kits. Incidentally, Kosmos was for a long time the title of the monthly magazine of the Kosmos-Gesellschaft der Naturfreunde, a well known nature organisation. As of 2019, the magazine was known as Natur. And yes, Franckh’sche Verlagshandlung W. Keller und Company was still alive and kicking as of 2019. This firm is known today as Franckh-Kosmos Verlags-Gesellschaft mit beschränkter Haftung und Company Kommanditgesellschaft, but back to our story. Contrary to what the caption of this week’s photo stated, the Logikus, if I may be permitted to use this abbreviated moniker, was not a pocket computer. Indeed, it was not a computer at all. After all, the Logikus had no random access memory or random order memory whatsoever. This being said (typed? ), it was not a toy either. The Logikus, say I, has been described as a mechanical calculator fitted with an instrument panel, a carriage and some switches. If I may be so bold, this description is about as useful as a textbook on quantum mechanics. Less so actually, as such a manual could be used as a door stop. Apologies to Sheldon Lee Cooper and any other theoretical physicist in the blogosphere. If the Logikus was / is not a computer, then, what was / is it? A good question, my reading friend. One could argue it was an electro-mechanical calculator. You do not seem very happy with this answer, now do you? Well, neither am I. If truth be told, a teenager who spent an hour with a Logikus would learn a lot more about the way computers worked than one who spent a day with a sophisticated machine of this type. So, let us open the hood of the Logikus, figuratively speaking of course, to figure out what made / makes it tick. In other words, have another look at the photo above and come back when you’re ready. I’ll wait. A keen student of material culture like you or I would not fail to notice 10 manually-operated 2-position switches and a plug board (with 600 plug holes?) in which one could insert several / many pieces of wire. What your keen eyes may not have spotted in the photo that illustrates this article, however, were / are a button, on the left, that the adult player is pressing, as well as a row of 10 light bulbs, mounted behind 10 windows, right in front of the young player. Said row was seemingly covered by one of the many strips of paper that came with the Logikus. The dry cell batteries that powered it were of course invisible. The Logikus came with spare parts, as well as a fairly thick programming manual that included instructions for assembly. Said manual included a number of programs that allowed the proud owner of a Logikus to do all the things mentioned in the caption yours truly quoted above – and more. A British version of the manual included several programs / games that were not in the original / German version. The switches, plug board and windows paralleled the inner workings of an electronic computer, from input to output by way of a programme. The plug board and wires were used to program the Logikus. The switches, on the other hand, were used to input the data that would be transformed by the program. Various combinations of lit light bulbs were used to highlight the answers, in other words, the output. And yes, my observant reading friend, the young player in the photo appears to be bored out of his skull, which would not be a good sign if you were a salesperson trying to convince the older player to buy a Logikus. As was to be expected, people in East German soon heard about the Logikus. They were so intrigued and impressed by it that Volkseigener Betrieb PIKO Sonneberg, a state-owned manufacturer of models trains, came up with an unlicensed / illegal version of it known as the PIKO dat. Launched in 1969, the new computer toy won 1 if not 2 gold prizes at the 1969 edition of the Leipziger Messe, one of the most important trade fairs held by member countries of a council for mutual economic assistance, or Sovét Ekonomícheskoy Vzaimopómoshchi, an organisation led by the Union of Soviet Socialist Republics. Would you believe that Volkseigener Betrieb PIKO Sonneberg owed its creation, under another name, in 1948, to the fact that, since all German model train manufacturers were located in regions of the country that were not under Soviet control, the enthusiasts who lived under Soviet law could no longer buy trains or parts because they did not have access to the currency used in regions of Germany controlled by France, the United Kingdom and the United States? Incidentally, Volkseigener Betrieb PIKO Sonneberg was privatised in the early 1990s. As of 2019, this firm was known as PIKO Spielwaren Gesellschaft mit beschränkter Haftung. Although similar in principle and appearance to the Logikus, the East German computer toy was somewhat different internally. These differences included the addition of a timer, a different number of plug holes for the wires (660 vs. 600? ), a different number of light bulbs (13 vs. 10), etc. You may be pleased to hear (read? ), or not, that, at the 1977 edition of the Messe der Meister von Morgen, an annual youth competition held in East Germany, a PIKO dat was used to control a model railway made by Volkseigener Betrieb PIKO Sonneberg. I am equally pleased to add that the first models trains made by the outfit that eventually became PIKO were displayed in the 1949 edition of the Leipziger Messe. Small world, isn’t it? Two American companies also heard about the Logikus through some as yet unknown channel and were suitably intrigued. If truth be told, they both acquired its production rights. Science Fair Electronics, a Tandy Corporation company, produced a machine known as the SF-5000 Electronic Computer. Interestingly enough, the 5th edition of the programming manual for the SF-5000 was printed in Canada in 1971. In 1977, Radio Shack, a division of Tandy, produced a slightly modified version of the Logikus seemingly known as the Digital Computer. It had a plug board with 200 rather different plugs and used strips made of plastic rather than paper, for its 100 experiments / programs. Logix Enterprises Limited, finally, on the other hand, produced a machine known as the O-600 Electronic Computer no later than 1972. Interestingly enough, Logix Enterprises, an American company, seemingly had a factory in Montréal, Québec. Indeed, this factory may have made a copy / version of the Logikus known as the Logix-Kosmos Electronic Computer or Ordinatron 600. 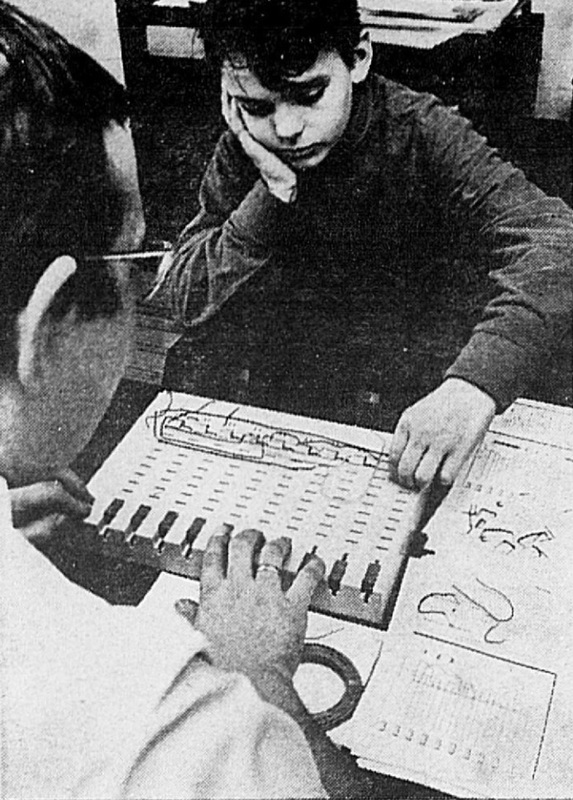 An ad for an Ordinatron 600 published in December 1972 by La Presse of Montréal, the most important French language daily in Canada, included a photo of the aforementioned Logix-Kosmos Electronic Computer. Interestingly enough, yours truly has come across a version of the Logikus, seemingly produced by Franckh’sche Verlagshandlung W. Keller und Company, known as the Kosmos Ordinatron 600. What was / is this Ordinatron 600, you may ask? A good question, I answer. Introduced in 1969, this computer toy was a version of the Logikus made by GéGé. And no, yours truly does not have the full legal name of this company, the most important French maker of toys of the 1950s. GéGé also acquired the production licenses for a number of experiment kits developed by, you guessed it, Franckh’sche Verlagshandlung W. Keller und Company. Would you believe that a brief text published in a 1971 issue of the illustrated newsmagazine Paris-Match stated that Wernher Magnus Maximilian von Braun, one of the key figures of the American space program, had designed a computer toy for young humans aged 12 and above – the Ordinatron 600 / Logikus? If you believe that, my reading friend, I have a bridge I would very much like to sell you. And yes, von Braun, a German whose National Socialist past was carefully buried for many years, inspired the title character of a movie classic, a ferocious satire from 1964, Dr. Strangelove or : How I Learned to Stop Worrying and Love the Bomb. The Logikus and its derivatives (GéGé Ordinatron 600, Logix O-600, PIKO dat and Tandy SF-5000) should not be confused with the Jouets rationnels JR-01, a simpler design introduced around 1970. Although invented by a professor at the Universidade Federal do Paraná, in Brazil, the JR-01 was perfected with the help of engineers from a French company, Bull General Electric Société par actions simplifiées. Jouets rationnels société anonyme was a most interesting company, founded to import and sell foreign toys in France. In 1959, it acquired the European rights for a revolutionary toy, the Écran magique, sold under the name Télécran. An American company, Ohio Art Company, acquired the production rights for the rest of the world around that time. You may have heard of this French toy, my reading friend who was once a child. It was known as, you guessed it, Etch-a-Sketch. Would you be pleased to hear (read?) that, as of 2019, the rights for this classic toy were owned by Spin Master Corporation of Toronto, Ontario? Yours truly remembers playing with at least one Etch-a-Sketch, a long time ago, but I was not very good at it. You may also be pleased to hear (read?) that the Logikus and its derivatives have become collectors’ items. So, having suffered through all of this pontification, do you think that the companies that made the Logikus and its clones tried to mislead buyers through false advertising, or was this product the innocent victim of an odd case of misunderstanding? Somehow, me thinks the former might closer to the truth. Some of the children who received a Logikus or one of its clones at Christmas in the 1970s definitely thought that their parents had been hoodwinked. They wanted to play with a real microcomputer; light bulbs and switches did not interest them in the least. In other words (numbers? ), see you next week.